Clear Creek Recreation Area is one of the most popular camping areas in the state due to its proximity to one of the cleanest man-made lakes in the country. Begin here and explore the many different water-related recreational activities in the area. From US 78 in Jasper, take Highway 195 N about 5 miles to CR27. Continue on CR27 northeast for about 8 miles to the campground. 2-night minimum stay on weekends, 3-night minimum stay on holidays. Leashed pets are welcome. Day use fee is $4 with an extra $.50 fee per person over six people. Golden Age/Golden Access accepted, and cardholder must be present. Campground is open Mid-March through November 1. Clear Creek Recreation Area is one of the most popular camping and recreation areas in the state due to its location on the shores of Lewis Smith Lake. This lake has over 500 miles of shoreline and some of the cleanest water of any man-made lake in the country, which makes it a popular destination for boating, swimming, and fishing. The campground here was built primarily to serve lake visitors coming to enjoy one (or all) of these aquatic activities. But with a children’s playground, beach, picnic area, hiking trails, and 102 campsites, there are plenty of options beyond carving a rooster tail behind a ski boat or reeling in one of the huge striped bass for which this this lake is renowned. 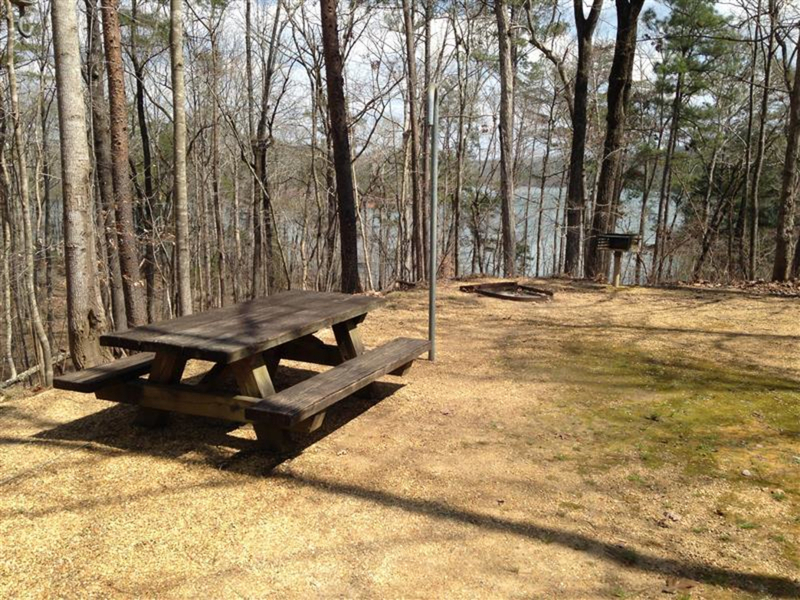 A modern facility with clean restrooms and camp sites outfitted with fire pits and picnic tables, this campground is a great option if you want to enjoy the clear, refreshing water of Smith Lake and aren’t concerned with sharing your time on the water with powerboats and jet skis. 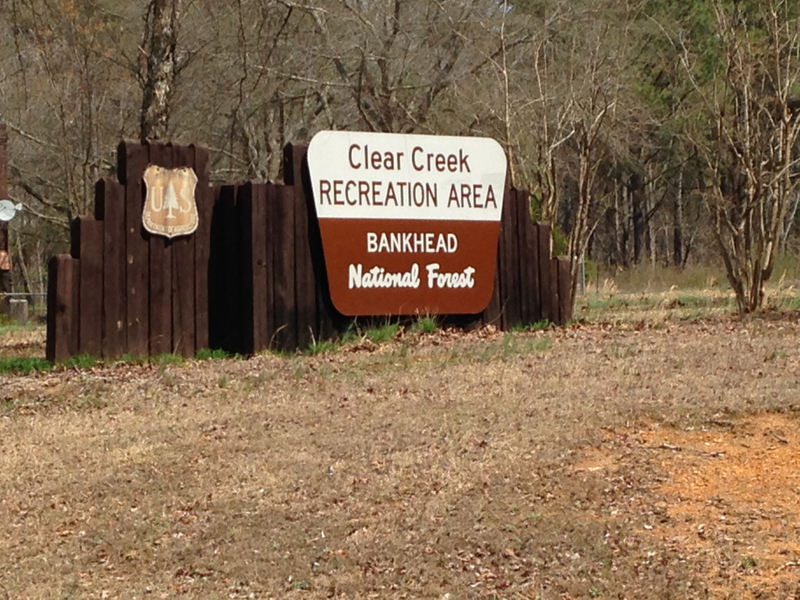 This campground is within day-trip distance from some of the more remote destinations in Bankhead National Forest, such as the Little Natural Bridge and the Sipsey Wilderness area. You can’t go wrong with amenities such as a play ground, vending machine. And each site includes power and water, a relaxing beach area, a smooth, paved bicycle path, boat launch, and well kept hiking trails. These private sites are asphalt, well-shaded and level to make it easy for RV camping. The pristine waters of Lewis Smith Lake make Clear Creek Camping a top choice for family fun. If you prefer to reserve your site in advance, the reservations must be made four days in advance for single sites and three days in advance for group sites. That shouldn’t be a problem with the friendly and helpful staff ready to guide you through a great stay. Clear Creek Campground is the perfect place to take family and friends for a weekend getaway. With grills at each site, it is a great setup for large groups ready to get out of the fast-paced city and take a breather. 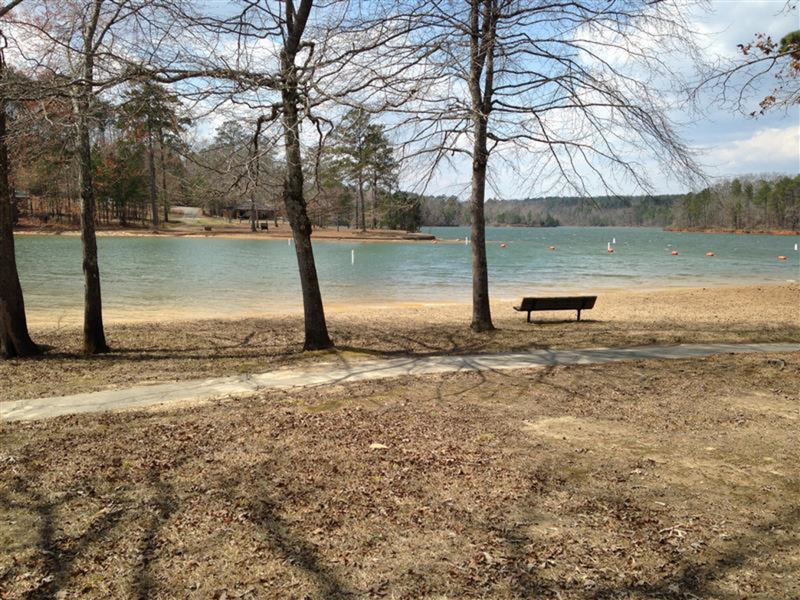 Swimmers will love the beach area and clean, deep waters of Smith Lake. Grab a group of sites and bring a crowd along to enjoy the easy hikes and fresh air. There isn’t much to offer avid hikers, and there aren’t any mountain bike trails. Private, shaded sites and plenty of room to run around will keep the kids busy sunup to sundown. From US 78 in Jasper, take Highway 195 N about 5 miles to CR27. Continue on CR27 northeast for about 8 miles to the campground. 2-night minimum stay on weekends, 3-night minimum stay on holidays. Day use fee is $4 with an extra $.50 fee per person over six people. Golden Age/Golden Access accepted, and cardholder must be present. Campground is open Mid-March through November 1.